No need to spend ages filling up with petrol or spending time and effort maintaining an engine, and no messing around with potentially dangerous cords. Simply pop in the powerful series X2 40V lithium ion battery, and at the press of a button you can get mowing - no starter cord to pull and no cords to battle with. The quick charging battery will power the cordless Aerotek Lawnmower for 35 minutes and mow lawns of up to 300-400 square metres*. With a supersized, 50 litre collection grass box you can get more of the lawn cut, in less time, with an extra-large, 40cm cutting area that gets closer to the edges. You can even use the mower with the mulching attachment to really nourish your lawn, with super fine nutrient rich cuttings. With a single height adjustment lever rather than four, you can adjust the cutting height, making it perfect for cutting grass that’s short or long. 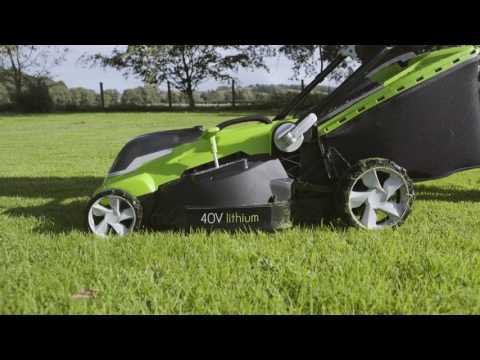 To top it all off, the brushless motor cuts down on maintenance completely, meaning once you've finished making your lawn look great, you really have finished. Easily fold it down for compact storage in your shed or garage when finished. Why not add a spare battery that allows you to mow for even longer and tackle larger lawns with ease? A spare blade is also available. 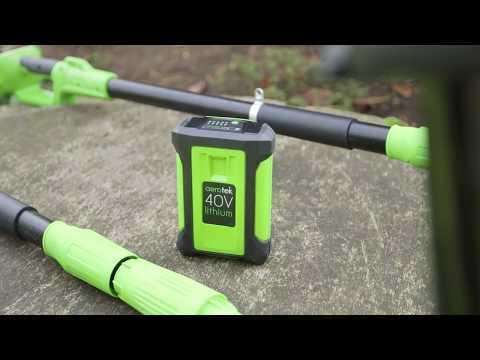 Please note the X2 battery is only compatible with the X2 40V Lawnmower and X2 40v garden power range.